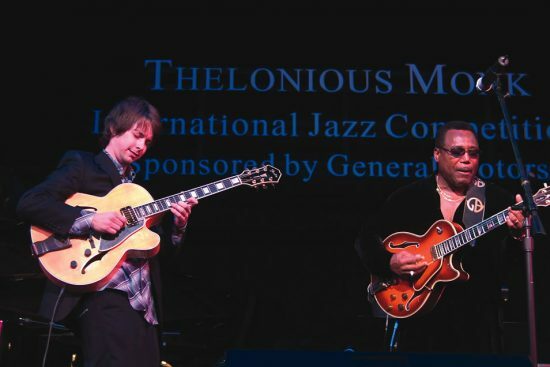 Norwegian guitarist Lage Lund, a graduate of the Berklee College of Music, has won the 19th annual Thelonious Monk International Jazz Competition. Lage’s artful arrangement of Billy Strayhorn’s “Isfahan” and his darting, articulate lines on Wayne Shorter’s “Pinocchio” made an impression on this year’s judges: Pat Martino, Bill Frisell, Russell Malone, Earl Klugh, Stanley Jordan and John Pizzarelli. For his first place finish, Lund won a $20,000 scholarship and an engagement at the Kennedy Center for next season. The second place prize of $10,000 went to Miles Okazaki, with New Orleans guitarist David Mooney taking home the $5,000 third place scholarship. Each of the three finalists performed two numbers backed by an all-star group with pianist Bob James, bassist James Genus, drummer Teri Lynn Carrington and tenor saxophonist Chris Potter. Okazaki was especially strong in his burning call-and-response exchanges with Potter, and many in the audience were surprised he didn’t win. Japanese pianist Junko Moriya won the International Composer’s Competition and performed her award-winning composition “Playground.” Its harmonic surprises and challenging, time-shifting meters were brought to life by Moriya, along with Genus, Carrington, Potter, trumpeter Don Sickler and guitarist Anthony Wilson. While waiting for the judges to announce their decision, the second half of the concert gave the judges and special guests an opportunity to show their stuff. One of the emotional high points came when Clark Terry played “They Can’t Take That Away From Me,” with Dee Dee Bridgewater and John Pizzarelli sharing the vocals. Terry cracked up everyone with his mumbles and perfectly timed conversational scatting. Other highlights included guitarists Russell Malone and Earl Klugh totally digging each other’s sound and solos on “Stella By Starlight,” while George Benson, who received the Maria Fisher Founder’s Award, looked oh-so-cool wearing shades, singing and playing “On Broadway.” As good as Benson was, Carrington and Genus nearly stole that part of the show when they opened up their rhythmic bag of fatback nasty. Stanley Jordan’s version of “Do You Know What It Means to Miss New Orleans?” with Bridgewater and trumpeter Terrence Blanchard never really came together and sounded a bit forced. Pat Martino and Bill Frisell’s mysteriously dark arrangement of “Footprints,” with Wayne Shorter and Herbie Hancock, was easily the most intriguing performance of the evening. The concert ended when Lund received his first prize and then stood toe to toe with Benson while they jammed on “How High the Moon?” The concert was taped for broadcast by BET Jazz, and the competition returns next fall featuring pianists.